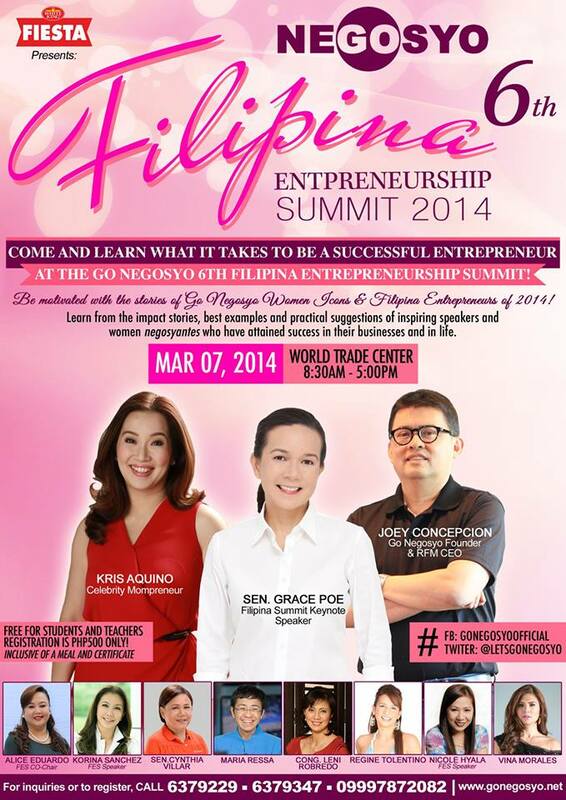 True to its commitment of building the Philippines as an entrepreneurial nation and in celebration of the International Women’s Month, the Philippine Center for Entrepreneurship, Inc. – Go Negosyo is holding the 6th Filipina Entrepreneurship Summit 2014 (#FES6) on MARCH 7, 2014, Friday at the World Trade Center, Pasay City. #FES6 is a one-day activity centered on reinforcing the entrepreneurial spirit of the Filipina by equipping them with a positive mindset, as well as the tools and concepts necessary for them to pursue the path towards success. It shall continue the annual tradition of recognizing women and their capacity to be catalysts of change and progress. The summit will also cover different entrepreneurship topics in the form of keynote speeches and plenary forum, as well as individual mentoring sessions featuring prominent female personalities, expert entrepreneurs and consultants including Sen. Grace Poe, queen of all media Ms. Kris Aquino, broadcast journalist Ms. Korina Sanchez and celebrity entrepreneur Regine Tolentino, together with female entrepreneurs like Juliet Herrera (Serenitea), Kellda Centeno (Adobo Connection), Roselin Pagunsan (Big Apple Express Spa) and many others. In addition, a select pool of outstanding and inspiring women entrepreneurs will be recognized as this year’s GoNegosyo Women STARpreneurs. This Summit follows the overwhelming success of the other Go Negosyo sectoral summits over the years.